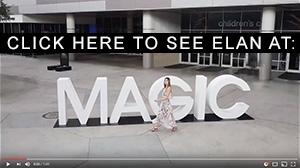 Since 1991, ELAN has designed fashionable clothing in high quality fabrics featuring flattering silhouettes with a relaxed fit, perfect for lounging or your next dream destination. The designers, Elan and his wife Galit, bring an international edge to the collection inspired by a love of travel and insight into global fashion trends. The ELAN brand appeals to the active woman on the go with a sense of style who appreciates value without compromising quality. ELAN provides the adventurous fashionista with her ideal dream closet. Whether it is a crochet cover up with bohemian vibes for the beach, a chunky cable knit sweater for a ski trip or a long flowy maxi that will turn heads at dinner, the ELAN girl, like our brand, has mastered the balance between comfort and making a statement. ELAN is your go to brand when you have somewhere to go! We are currently seeking a Production & Fashion Coordinator. Oversee pre-production of sample requests, product development, costing and customer requirements. Apply knowledge of fashion merchandising to assist fashion designer w/ development of proprietary seasonal collections. Participate in trade shows with organization of the company’s collections. Perform market forecasting & fashion trends. 6 months experience w/ MS Excel & PowerPoint & Adobe Photoshop & Illustrator.